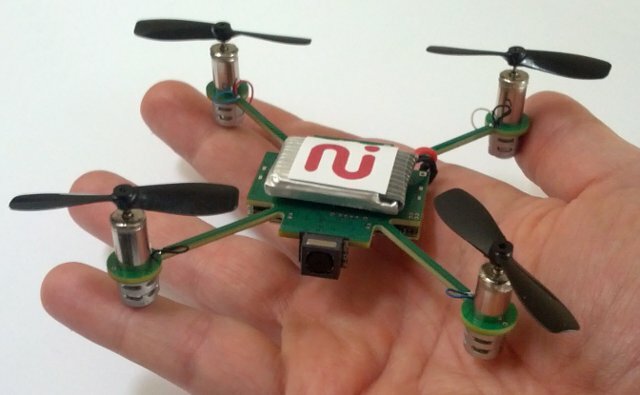 Earlier today, I’ve posted a list of some interesting sessions for the upcoming ELC 2013, and one of the talk entitled “Lessons Learned in Designing a Self-video Self-hovering Nano Copter” by Gregoire Gentil, Always Innovating CEO, caught my attention. In this presentation, he will talk about the technical challenges the company encountered when they designed MeCam, a self video nano copter to point-and-shoot yourself, that should sell for just $49 retail. The MeCam launches from the palm of a hand and hovers instantly. It streams video to an Android or iOS phone or tablet that can be easily shared on social media platforms such as YouTube, Facebook, Google+ and Twitter. There’s no remote control for the MeCam as it’s either controlled by voice commands, or it can be setup to follow you around thanks to the follow-me feature. It can also do panorama shots automatically. I could not find a proper live demo of the MeCam, but Gregoire uploaded a promo video for the device that explains what it’s capable of, including a short peak at the MeCam in action, and that just looks awesome. It could lead you to say “Want!” or even “Shut up and take my money!”. Always Innovating is a design company, not a manufacturer, so they are currently looking for licensees, and expect the MeCam to hit the shelves in Q1 2014. You can find more information on Always Innovating’s MeCam page.